Chinese boxthorn (Lycium barbarum): growing, planting, caring. 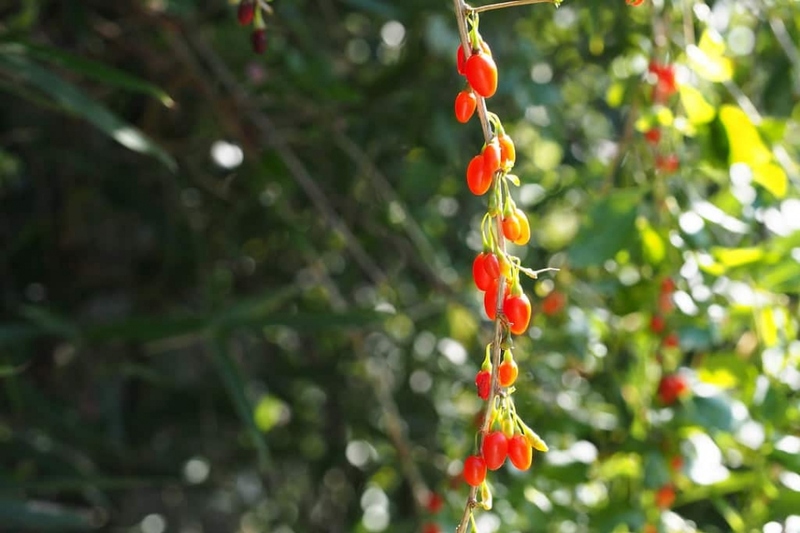 The shrub producing goji berries - you can actually grow it in most temperate climates. Full description for Lycium barbarum not yet available. Plant your wolfberry preferably in the fall, in full sun. Apart from this need of light, this shrub will adapt to all conditions, as long as the soil is not too heavy. Plant in a hole at least twice as big as the root ball. Basin the roots before planting, it will greatly improve the chances of recovery. Plant being careful not to bury the base of the stems. Form a hollow around the plant, it will be used for watering during the first months. Tamp the soil around the roots - do not hesitate to use all your body weight! Finally water until filling the planting hollow, at least two watering cans! You can also plant wolfberry potted in a draining soil, with a layer of clay balls or gravel at the bottom. Take a pot at least 40 cm in diameter, without being too big if you have to move your pot in the winter. Water regularly and copiously for a few weeks after planting. After, you will have to worry about watering only if your wolfberry is in pot: outside of these conditions, it will manage itself, and support better dry ground than wet ground. If you keep your chinese boxthorn potted, plan a potting every 2 to 3 years in a simple potting soil and a slightly larger pot. Unwind the root hair if you can, this will help him settle into its new container. Cut the wolfberry for it to produce many fruits. Why ? Because otherwise it will form a single trunk with a few long branches. In winter - especially the early years - trim to limit the height of your shrub. Cut the terminal branches around half their length, just above a bud that is facing out. The wolfberry is perfectly adapted to outdoor cultivation, however it can be grown indoors if you wish. In this case, we advise you to shelter it in winter in an unheated room - around 5 ° C.
Mulch your wolfberry in the fall or spring, with shredded wood - no softwood, if possible. In autumn, we advise you to use the dry leaves that you have just picked on the lawn as mulching.